Colin and Zander were identical twins. 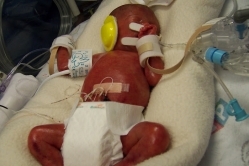 They were diagnosed with TTTS (Twin to Twin transfusion syndrome) around 17 weeks. I underwent Laser Ablation Surgery around 20 weeks to try to correct to connecting blood vessels between the boys. Due to the stress of this condition, Zander developed heart failure in utero and they were born at 25 weeks by emergency C-Section. They fought hard for 10 days. We had so many plans for them, but God had other plans for them. They are in a better place now, and we can’t wait to be with them again.